A few weeks bag, my friend Chow and I cooked dinner at her place. 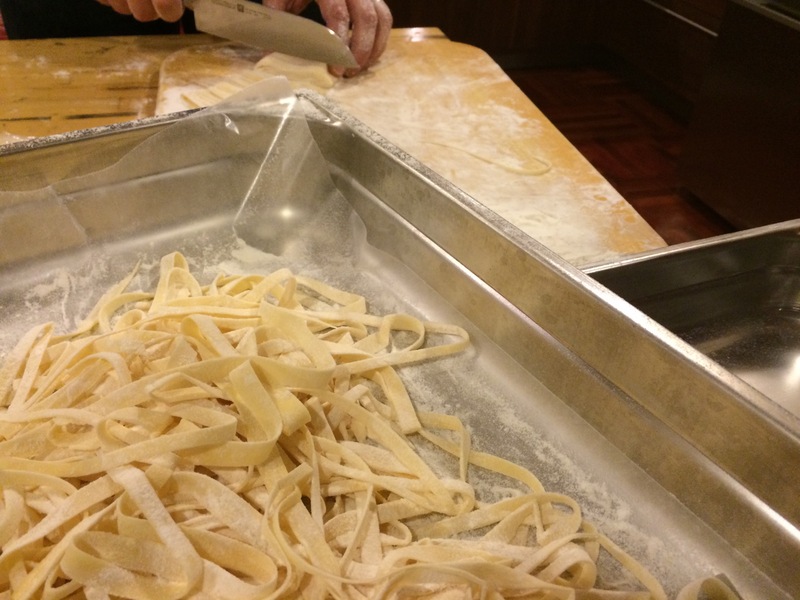 It was the first time in a long while that I made handmade pasta. There are many recipes. I opted for Jamie Oliver’s, which is incredibly simple: for each 100 grams of “type 00” flour, add an egg. After combining the two ingredients, you must knead for a very long while, until the dough takes on a silky texture. This excessive kneading explains why Italin grandmothers have Popeye-like forearms. After kneading and a half-hour rest, you roll out the dough. 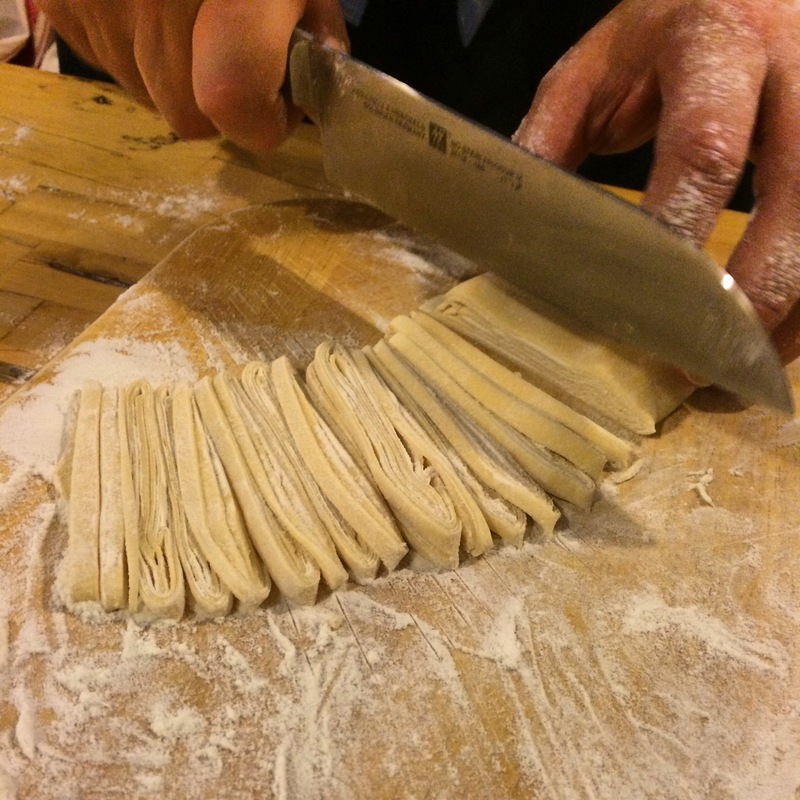 A rolling pin can be used, but a proper pasta roller is quite handy. This process further develops the dough’s texture and makes it sufficiently thin. After rolling, you gently fold the dough on itself and hand-slice it to the desired width. The final step is to separate the strands and then cook them in boiling, salted water. The uncooked pasta can be stored for a few days in the refrigerator. 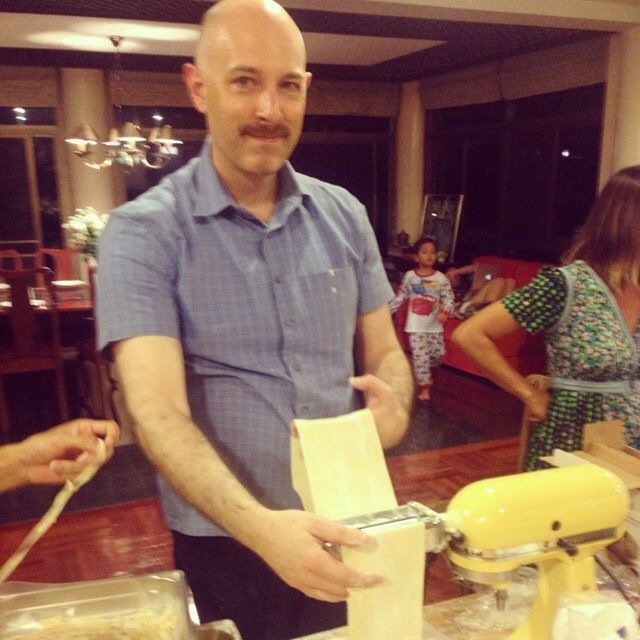 This entry was posted in Cooking, Food and tagged homemade pasta, pasta by christao408. Bookmark the permalink. For some reason I’m quite intimidated by home made pasta. The recipe sounds simple but unfortunately I don’t have a pasta machine. Do you have a rolling pin? Come visit again. Or better yet, make some yourself! I have flour and eggs but no rolling pin or pasta maker. Maybe you can fly over whenever I have the urge for some pasta. As with Sheldon, you can use a winds bottle. gosh, it’s been such a long time since i last made pasta by hand. i wonder if my hands would still remember how. plus, i miss having my very own kitchen. Let’s get you your own kitchen, then!